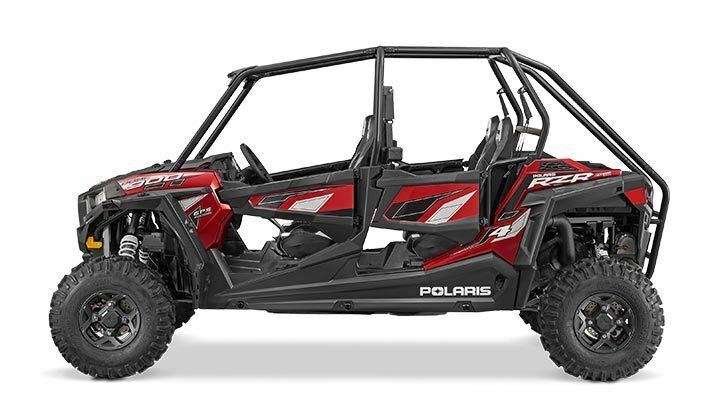 OPTIMIZED TRACK WIDTH: The RZR 4 900 inspires confidence through corners thanks to an additional 1.3 inches of rear track width all while maintaining an overall vehicle width of just 60". 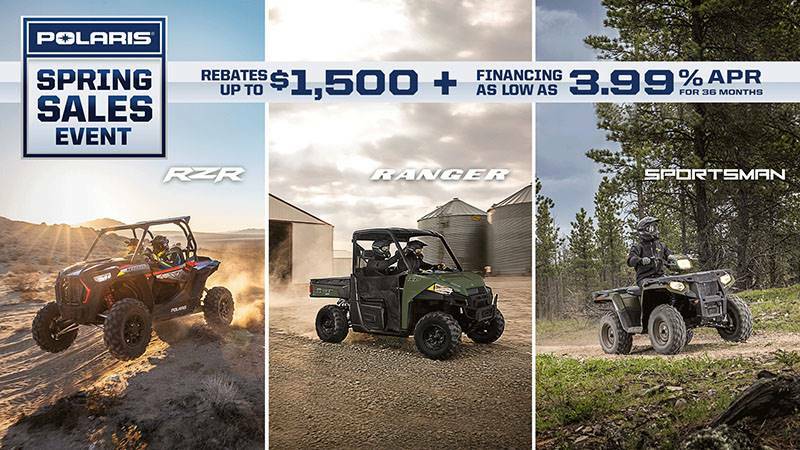 HIGH PERFORMANCE TRUE ON-DEMAND ALL-WHEEL DRIVE: The High Performance True On-Demand All-Wheel Drive System features a close ratio final drive to keep the front wheels pulling stronger and longer maximizing power delivery to the ground on even the loosest terrain. Providing increased traction without sacrificing steering effort to provide unmatched point-and-shoot handling. IMPROVED STEERING COMFORT: The RZR 4 900 features 20% faster steering response with an improved 2 turn lock to lock steering ratio. STANDARD ELECTRONIC POWER STEERING: The smoothest, most responsive electronic power steering available, with Variable Assist for easier steering at lower speeds. Our EPS lets you ride all day with less fatigue. 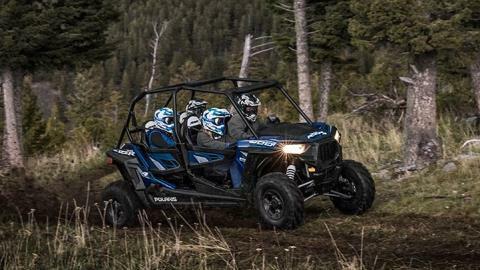 CENTERED COCKPIT: Every RZR is specifically engineered to provide the driver and passengers with the most exhilarating, comfortable ride on the market. 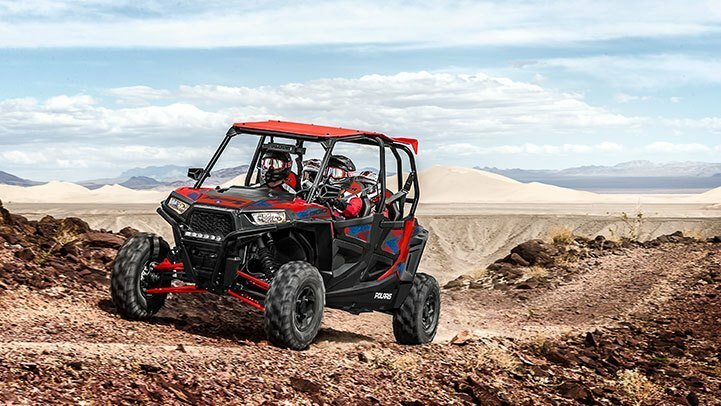 From the patented design that places the engine behind the seat to the placement of the occupants towards the middle of the vehicle, RZR’s design provides a low center of gravity for unparalleled handling and ground-hugging performance. OPTIMIZED DRIVER POSITIONING: For better driver positioning, the RZR 4 900 features an adjustable seat slider and new seat angle for a more comfortable driving experience. The angle situates the driver closer to the steering wheel bringing the elbows closer to the body for less arm fatigue and a more natural driving position. 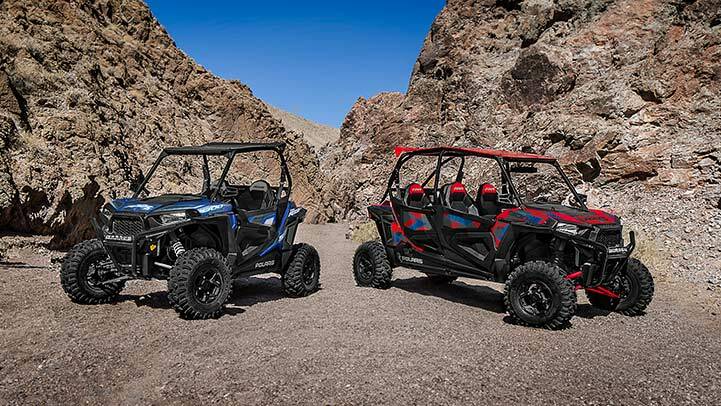 COMFORTABLE AND CONVENIENT INTERIOR: The RZR 4 900 provides plenty of room to get in and get out and ample leg room for all day comfort when navigating the trail. The cab features bolstered seats with thin-film material to keep occupants drier, adjustable tilt steering, space-optimized foot rests, rear passenger knee pads and grab bar, and factory-installed quarter doors that keep the occupants planted and secure. Additionally,removable floor drains allow you to washout debris and mud quickly and easily. 75HP PROSTAR® 900 ENGINE: The New 75 HP ProStar® Engine delivers the power & acceleration you have been waiting for. With hallmark ProStar® features like dual overhead cams, 4 valves per cylinder and electronic fuel injection we've upped the torque 14% and increased HP by 40% over the RZR 4 800. HIGH-FLOW CLUTCH INTAKE SYSTEM: The New High Flow Clutch Intake System is the most durable clutch system ever for multi-seat performance. Featuring a re-designed clutch cover, and ducting system that provides more airflow and decreases belt temperature by close to 50 degrees. TRAIL FRIENDLY LOW GEAR: A trail friendly low gear allows you to operate the machine in low gear while still maintaining a top speed of 40+ MPH. 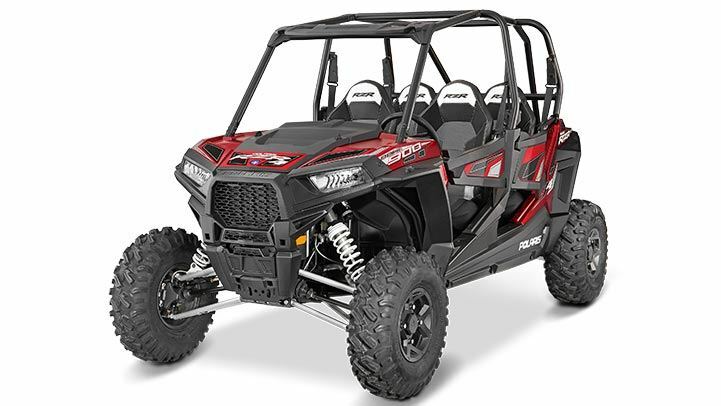 SUPERIOR TRAVEL AND SUSPENSION FOR THE TRAIL: With 12.25" of front suspension travel and 13.2" in the rear, and Fox Performance Series 2.0 Podium X Shocks, the RZR 4 900 Suspension can be tuned for exactly the way you ride. New geometry designed for specific types of terrain gives you a performance based machine that's ready to tackle the trail. TUBULAR FRAME AND D-PILLARS FOR IMPROVED SUSPENSION PERFORMANCE: The tubular frame and D-pillars increase frame rigidity allowing the suspension to absorb shock instead of the chassis resulting in more consistent suspension performance. 27" GBC DIRT COMMANDER TIRES: New 27" GBC Dirt Commander 8-ply tires offer better side bite, stiffer sidewalls, better tracking through corners and increased durability.